I recently picked up a bunch of items from various on-line vendors including By-the-sword, which seemed to have a lot of the higher quality items, seemingly from a supplier in England. They had a really nice German Landschnecte sword, a war mallet, war hammer, and a nice mace... All items ranged from $300-about $900 (their best Landschnecte sword). Well, the first thing that comes to my mind, if you want a combination of fantasy and functionality is Ollin Swords. Jody Sampson's work is primarily fantasy and aesthetically driven I believe, but a lot of his pieces sound a bit too heavy to be functional. But, never having handled one, this could just be me. His axes look pretty neat though. As for double bladed axes, I don't believe there is any historical evidence of them being used for combat, which may be why you're having trouble finding well-made ones. Now, I don't have any experience with this vendor or their wares, so I can't say how "usable" their products might be, but www.wulflund.com carries a variety of fantasy-inspired pieces, including a double-headed axe and an amusing steel maul (made hollow to keep the weight down). I also like the flanged mace and the 2 handed mace. I'll defintely pick up some stuff from OLLIN, JODY SAMSON, and RAVEN.... any other items or unique 'best in class' pieces, please let us know! Is there a way to upload some images, I have some updates and pictures I'd like to post. Or do I have to upload them to my ISP and make a link? Thanks! By the way, can some of you take a look at the above links and take a look at these weapons. They seem very good quality, yet I do not recognize any of their products as coming from ANY manufacturer we all usually talk about... I wonder who is supplying by-the-sword with these high quality items? You can upload images using the "Add an Attachment" field below the "Post a reply" field - just click the Browse button and find the image on your computer. If this doesn't work, you can upload them to a host like www.imageshack.us, copy the address in the "Direct Link" field, and paste in between "[img]" and "[/img]", and it will appear on the screen. I want to hold off posting of pictures until I have them evaluated... hopefully sometime next week I'll revisit this thread and post what I'm thinking about. took the image photos, but need to wait a little.... Thanks for pointing out the attachament section!! MRL used to have a pretty fierce looking bardiche.....For double headed axes look at by the sword .com......They, of all places should have it. Does anybody know who supplies by-the-sword for the items listed above that I previously purchased? By-the-sword's highest qualit items come from one supplier/manufacturer, but I'm not sure who... Any ideas? Raven Armory makes Snaga the Sender, but it is way too expensive. Much of By-The-Sword's higher quality stuff comes from www.Outfit4Events.com (or from whoever Outfit4Events gets it from). I asked about their supplier for the items in the "Arms and Armour" section at By-the-Sword one time. I was told that they could not reveal the name because it was a name I might recognize. I'm pretty sure he also mentioned that the vendor was in the UK but if so I cannot imagine who that might be. I appreciate the information.... Thank-you. Most of the items are the same as Outfit4Events, which is an Eastern European (Czech?) firm. The pictures are the same. 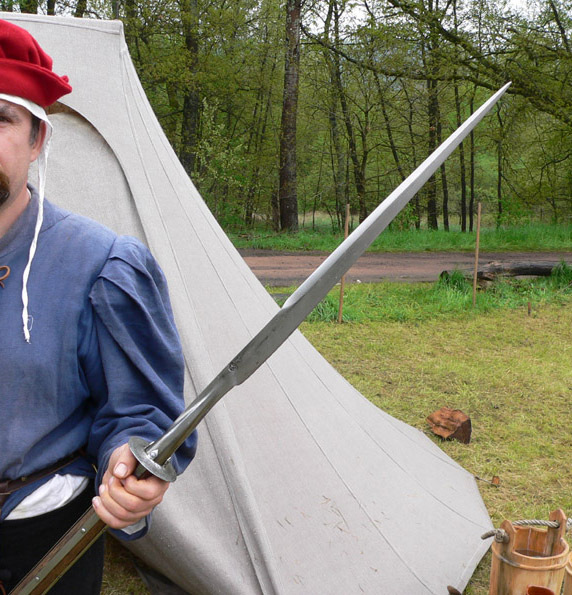 By-the-Sword may also carry some Get Dressed for Battle items; GDFB is a British firm. Just made an order, much appreciated! In any case, I picked up their two top 2 maces and top two 2 flails... awesome. I actually talked to who seemed to be the owner of Outfit4Events/Wellcrafted S.R.O., his name is Helmut. It was only 17 cents a minute to call the Czech Republic thru Yahoo messenger using my laptop. I think their payment server was down for a little bit. In any case, if anyone knows of any more places like Outfit4Events, please let me know. They really have excellent stuff for the price... I ended up getting a dagger and two throwing axes as well, just because of the quality/price. Swords seem a bit easier to get a variety, but things like: poleweapons, axes, maces/flail/percussion, etc.. seem harder to find good choices. Nonetheless, I really enjoyed shopping at Outfit4Events. I looked at Get Dressed for Battle and they had a nice selection of armor and random supplies, but had very little weapons. I'll look again. If there are any other stores like Outfit4 Events with such a huge inventory, great prices, and great products, I'd love to know about it. Thank-you so much Chad, I just added 8 items that I would not have otherwise added!!! This looks interesting, has anyone ordered from Arma Bohemia before and what is your opinion? We have a review of an Arma Bohemia dagger on our reviews page. I own another of their items and may soon receive another order from them. They deal with multiple small craftspeople from Eastern Europe. In my experience, the products are generally good, but the communication and follow through could be much better. It may be a culture thing, but taking 2 weeks or more to return an email (pretty regularly) seems excessive to me. I'm looking forward to getting that big order from outfit4events sometime in mid-end June.... They really had some awesome flails, maces, daggers, pole-weapons, etc... I think they are more interesting and detailed than the offerings at A&A for items other than swords or rapiers.